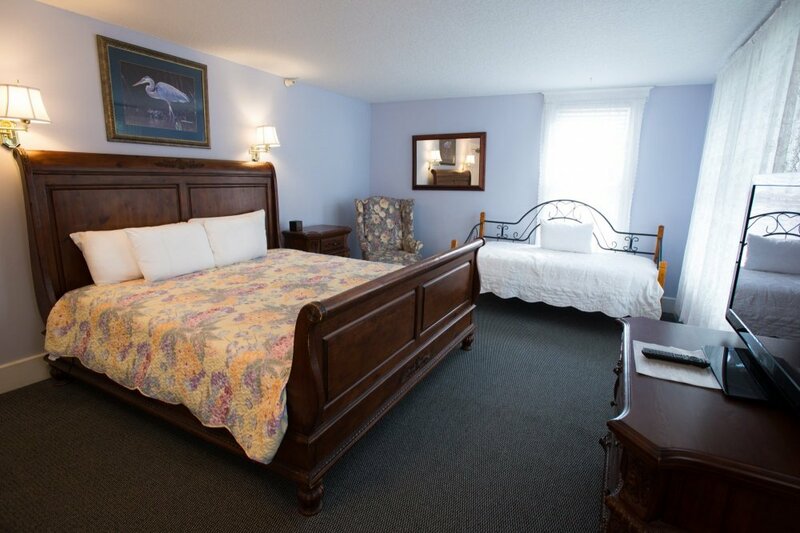 We have 14 rooms & suites in 2 buildings. 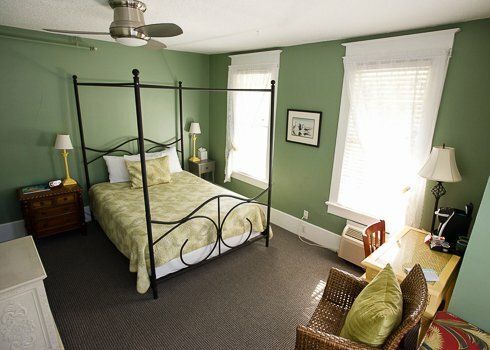 All have private baths, flat screen TVs and in room Keurig coffee makers. Beyond that, each is unique. We are constantly updating & changing things around, so be sure & ask if there is a specific item or color that is important to you. 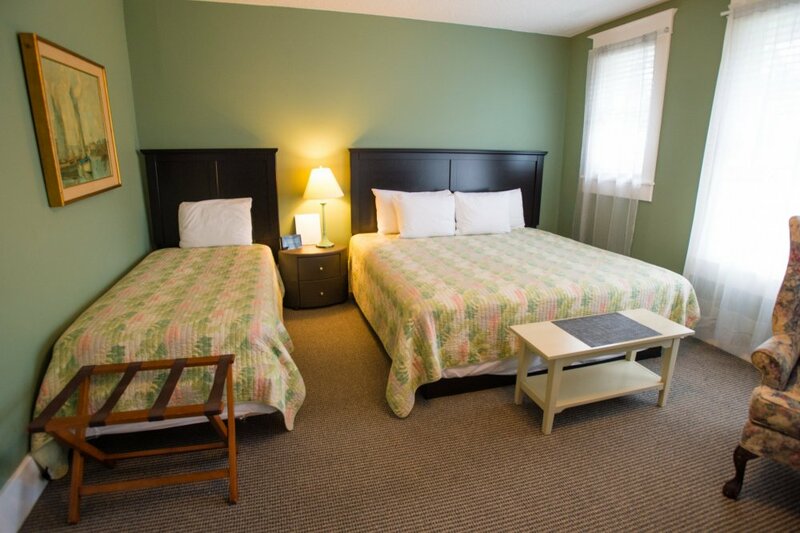 Rates are based on double occupancy, are subject to change and are higher on some holidays & special events. Rates shown below reflect general low & high season rates. For rates & availability on your specific dates, click the blue “check availability make reservation” button where you can browse or make your reservation online. The calming effect of cool blue and white set off a spectacular carved king bed with matching desk & dresser. This spacious suite has a sitting area with love seat and features an elegant non-functional fireplace, great for relaxing after spending time in the double whirlpool tub with shower. Flat screen TV, Keurig coffee maker, wireless internet. A fabulous carved king sized canopy bed with bed curtains is the focal point of this room, decorated in muted greens and ecru. The large bath offers both a relaxing double whirlpool tub and separate shower. Wheelchair accessible. You will be completely alone in the only third floor guest honeymoon suite. 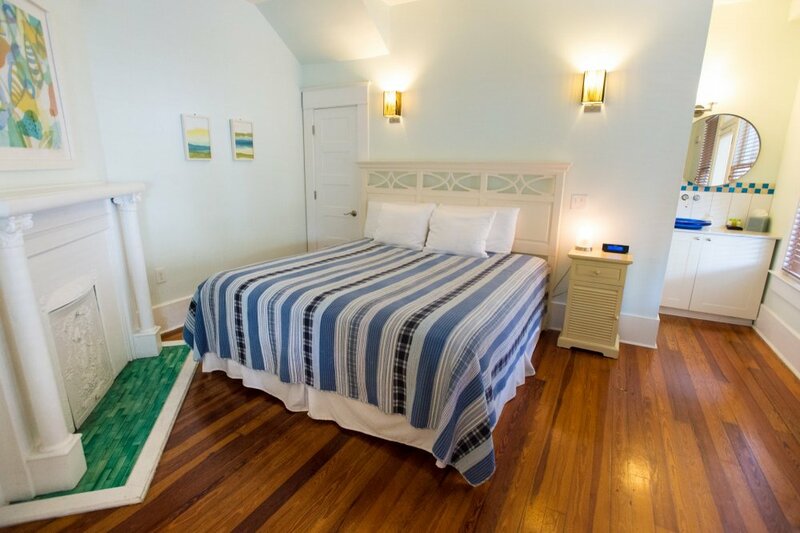 Secluded, romantic and very intimate, you will get the sense of entering a lighthouse as you ascend the stairs to the soft green-colored suite with mahogany furnishings. 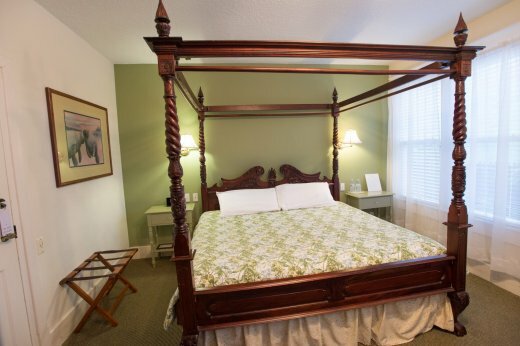 The Grand Savannah Canopy king honeymoon bed, tucked into its own dormer side room, is draped in white lace. 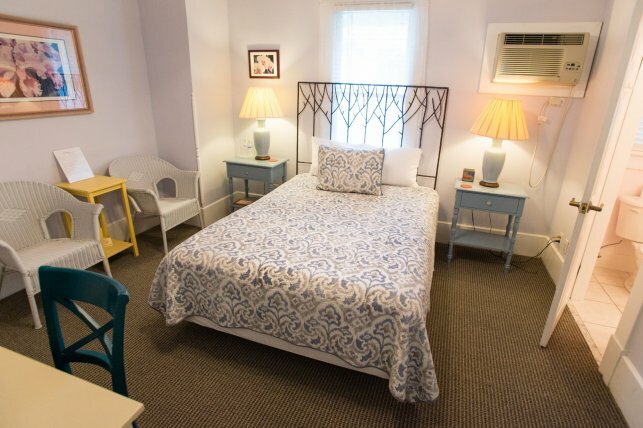 The room offers a separate sitting area with a twin daybed and wet bar. A double whirlpool tub with separate shower completes the room. One of the most beautiful honeymoon suites in Florida! A feeling of warmth is captured in this quaint room with walls painted in raspberry and trimmed in white. 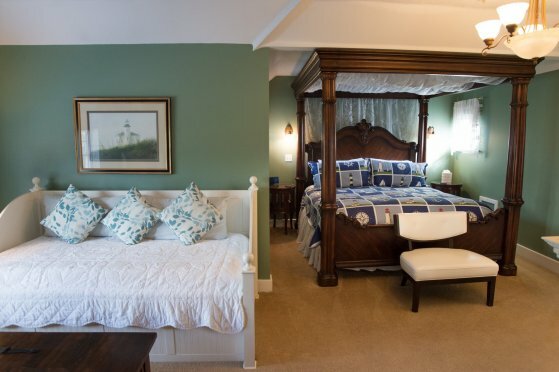 It features a colonial style poster queen bed in crisp white linens. White lace curtains surround the bay window with a comfortable window seat over-looking the avenue below. The bathroom is complete with a full shower. A very cozy room with four poster canopy queen bed. Walls of soothing green frame the window seat in the bay window. This room is similar to the Hibiscus room including the sunny shower bath. For parties traveling together, the Egret room and the Hibiscus room can be adjoined by closing off a hallway door. Pale blue and whites accent this queen room. The romantic double whirlpool tub with rain forest shower is secluded in its own room. Orchid is a non featherbed room. This large king room features an extraordinary draped soaking tub, the ultimate in relaxation, as well as a seperate shower. The pale yellow bedroom boasts a unique king canopy bed with views of the pool & garden. Decorated in shades of blue, this room features a delicately carved king bed. Mahogany furnishings complement this relaxing room. Complete with a soothing double whirlpool tub with shower. 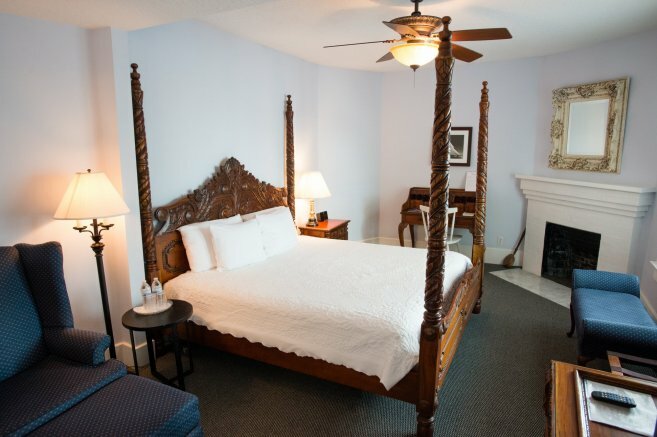 Experience old Florida luxury in the Veranda Suite. Enjoy a mint Julep (not included) on the wrap around porch. 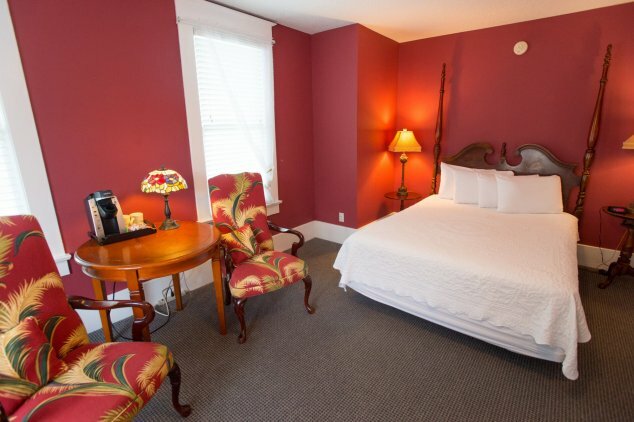 The bedroom has a king featherbed, antique fireplace (non functioning) and modern bath with a large shower. The original double sliding doors separate it from the living area which features a queen sofa bed. A kitchenette with refrigerator, microwave & dining table make the suite comfortable for longer stays. 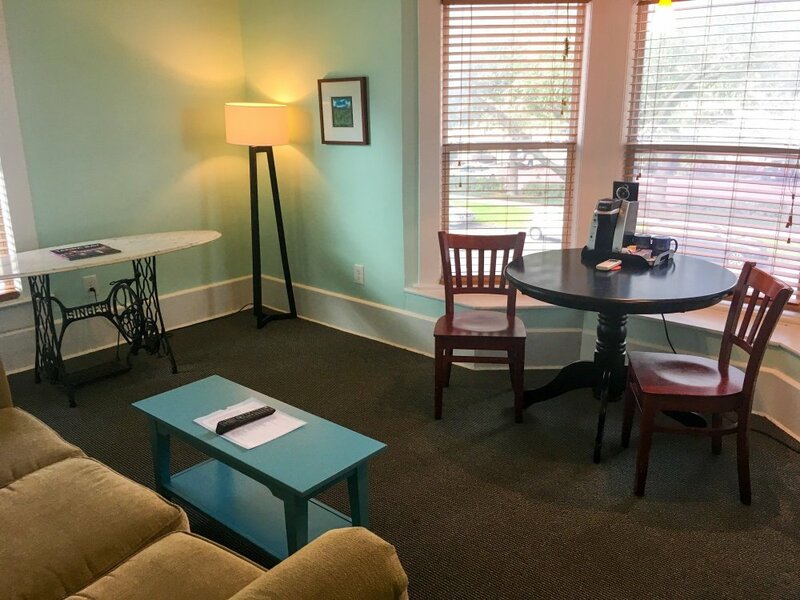 The Bay Gables luxury suite is on the second floor of the Bay Gables building. Your living area is at the top of your private stairs with a queen sofa bed and a dining table in the bay window. The bathroom with shower & a kitchenette with refrigerator & microwave separate you from the large bedroom. A king featherbed awaits across from the bay window seat. High ceilings & lots of light. 2 Flat screen TVs, Keurig coffee maker, wireless internet. 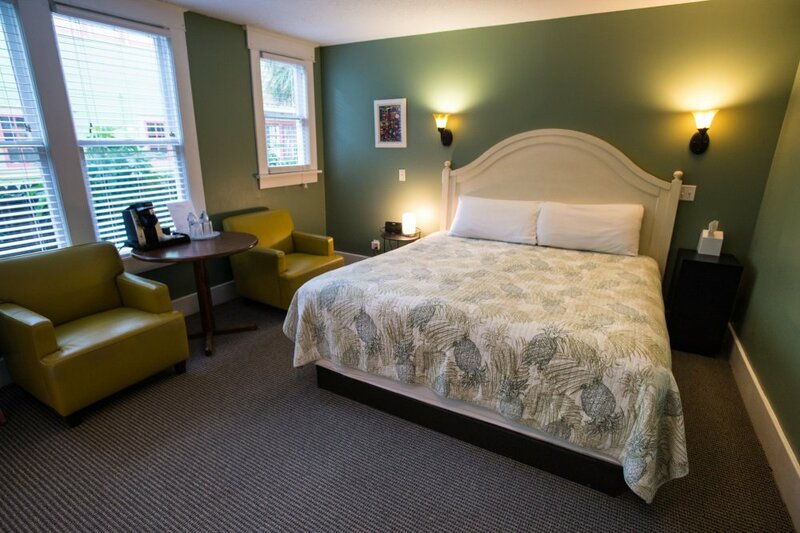 A tranquil King room on the main floor in soft green with leather lounge chairs as well as a work table. 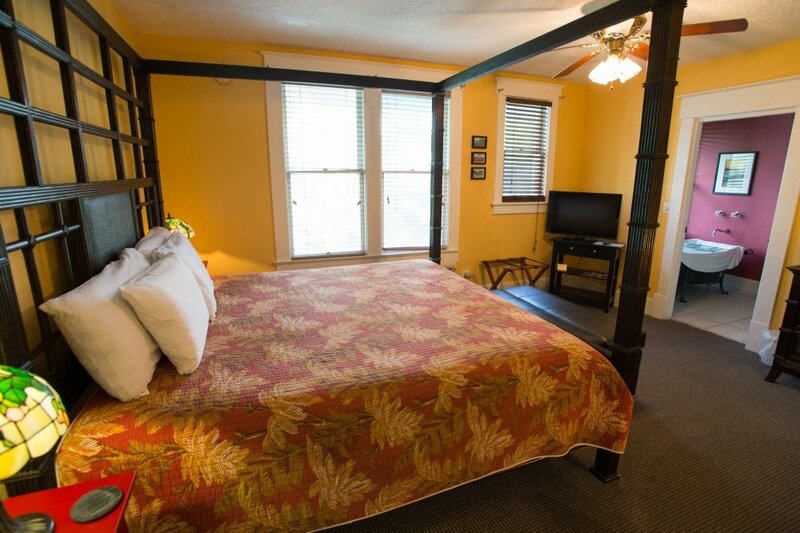 Pelican features a 37" flat screen TV, Keurig coffee maker & private bath with shower. A non featherbed room. Wireless High Speed Internet. 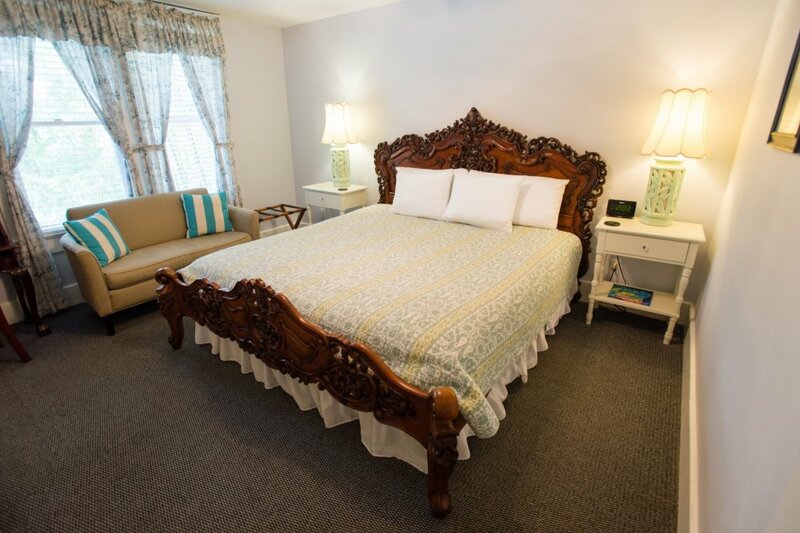 Escape to the tropics in this airy Queen room on the main floor in pale blue. 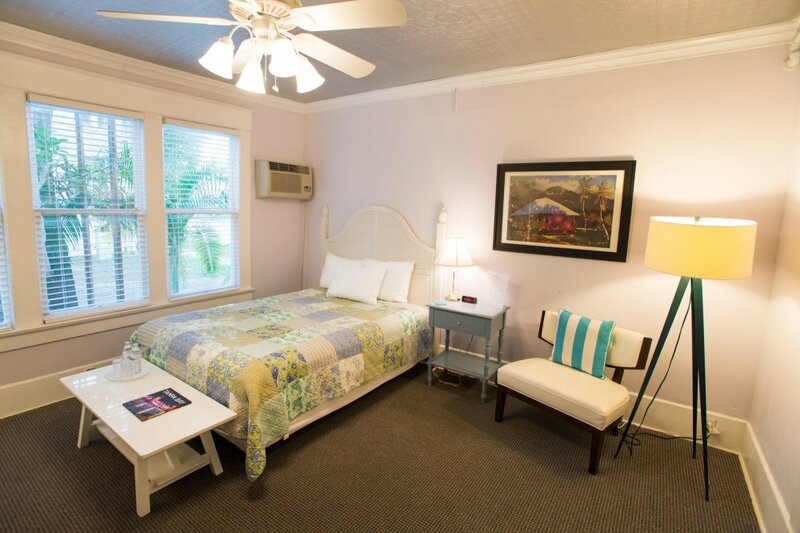 Conveniently located off the parlor, Key West features a 54" flat screen TV, desk & seating. Its large private bathroom has a roomy shower. A non-featherbed room. Keurig coffee maker &Wireless High Speed Internet.